@Dr. Eddies Wingman not sure if you can view this but it's a short item about the convention of lots of skating champions. Also Norwegians! Some Dutch as well! The glory the past. Double heartbreak in the very last pair of the 10,000m in the allround world championship in Amsterdam. First, Sven Kramer. He was already in a difficult position, having to beat Sverre Lunde Pedersen by 16 seconds and Patrick Roest by about half as much, in order to win overall. But after just a few rounds, it was clear that he didn't even manage to follow Pedersen. A fall from being the first Norwegian to win an allround title since 1994. But kudos to the crowd, who seemed to appreciate his effort. The cheer he got when entering the podium to receive his silver medal sounded even louder than the cheer for the winner ...! Now it's going to be exciting to see just how good Roest will become. Maybe next year we'll have another duel between him and Pedersen? But what will happen to Kramer? Can he come back to his best one more time? It is official: Today, Ole Einar Bjørndalen announced his retirement from professional biathlon. Night Prowler and Dr. Eddies Wingman like this. Yes, that on purpose I did. Sweden are the World Champions Ice Hockey. They won from Switzerland in a shootout. Ouch, Switzerland almost won their first world title (and first ever golden medal in a big tournament since 1926 when they won the European Championship). 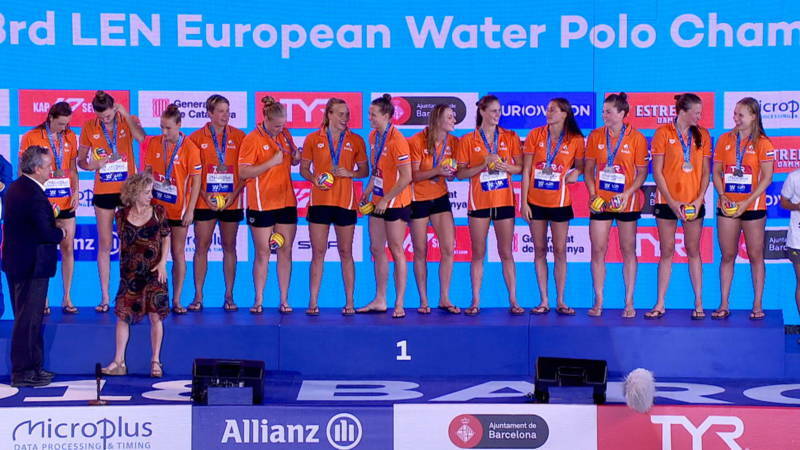 After 25 years, the Dutch waterpolo women are European champions again! Their fifth EC title! The EC is organized since 1985 and is held every 2 years (except three years between 2003 and 2006). Together with Italy they are the two most successful countries now, each having 5 titles. Go to the last minute of the match and see the celebration, around 1 hour and 4 minutes. My mother once got extremely hammered with the Canadian women's polo team. My parents met them in a pub, and started asking for motherly advice and paying with Jägerbombs. Spent most of yesterday watching the Spa 24 Hours. Decent race, though I kinda lost interest in the last few hours (once the last of the Bentleys retired with a buggered wheel bearing). Ended up as a BMW 1-2. Holy, holy, holy cow! What a thrller. Everybody, check this out! Ferry Weertman (Very weird, man!) has become the European champion at the 10 kilometer marathon swimming (for the third time) in an insane manner! Read on and watch! After some extremely exciting minutes Weertman stayed ahead of the Hungarian Kristof Rasovszky, with a microscopic(!) difference. Weertman started his well-known catch-up race in the final kilometers, but initiallyhe could not get to Rasovszky who was leading. Instead he fought for second place with the German Rob Muffels. It was not until the last hundred meters that the reigning Olympic champion came alongside at Rasovszky and miraculously tapped a MILLISECOND ahead of the Hungarian on the finish board. " Jakob Ingebrigtsen wins the 1500m in the European Championships and is the third brother to do that! Earlier his older brothers Henrik (2012) and Filip (2016) have done the same ... and for good measure, they were both in this final, too! Saw that, mate! Amazing. Great race. My father-in-law was very angry that the Polish dude did not start his finish comeback race 2 meters earlier. He went fastest over the finish and almost had Jakob. What a weekend for the two best women in cycling. Annemiek van Vleuten (who won the time trial World Championship with huge difference last Tuesday) broke her knee during Saturday's World Championship (can't cycle for 6 months, probably ) but finished the race and even did very well. Van Vleuten was on target for a double before the fall 90 kilometers from the finish. Even after crashing, she still finished seventh. At the end of the day Anna can finally hug Annemiek in the hotel lobby. Anna van der Breggen's title is the eleventh Dutch world title since the World Road Championships for women are held since 1958. The Netherlands have the most victories now. France: 10 times. Belgium: 6 times. So it is over, Petter Northug retires from international cross-country ski racing. His cocky style has annoyed or amused people, he's been a rarity in a sport where the archetype has been the diplomatic (or even reserved) athlete who most of all seems to be eager to get back out in the woods rather than revel in the spotlight. His greatest achievements? Probably the World Championship events in 2011 (two individual gold medals, one 2nd place, last man in the gold winning relay team and 2nd in the team sprint with Ola Vigen Hattestad), and 2015 where he won the individual sprint and 50 km. plus the team sprint and captained the 4*10 relay team again. Many would be surprised that he carried on after he suffered a bad knee injury after an ugly fall in Kitzbühel three years ago, but not only did he carry on - since that accident, he has 14 top 3 finishes in World Cup races, four of them victories, and Olympic gold in downhill from 2018.